a 70ft tree collapsed onto the roof of a community centre in Heysham Village during high winds on Wednesday afternoon. Winds of up to 50 miles per hour are believed to be the cause of the tree uprooting in the grounds of St Peter’s Church in Main Street. Lancashire Fire and Rescue Service received a call at around 2pm on Wednesday January 11. Firefighters attended the scene and cordoned off the entrance to the church grounds, as fears mounted that a second tree could be about to drop. The tree caused damage to the roof of the building, which had only recently been renovated. No-one was inside the building at the time. Station manager John Winder, who spoke to the Lancaster Guardian at the scene, said: “We’ve got a 70ft beech tree affected by the wind and it has collapsed on to the top of the community building. “There is significant damage to the roof, but at present its static as it is led across the building. “The tree surgeon’s advice is that the movement has compromised the roots of a second tree, and that’s my concern at the moment. “There’s a residential property in the grounds of the church, so we’re currently trying to locate the family as their only access is by going past the tree. Station manager Winder said that firefighters hoped to make the building watertight as the tree had pierced the roof in several places, and heavy rain was forecast for the coming days. 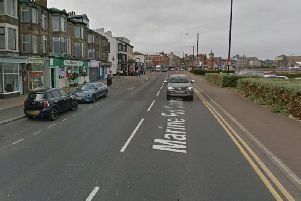 Main Street in Heysham Village was closed to traffic as the Lancaster Guardian went to press.